Professor Christopher Wiebe started his academic career as an undergraduate at the University of Winnipeg. He completed his M.Sc. and Ph.D at McMaster University and was an NSERC post-doctoral fellow at Columbia University. After a teaching position at Brock University, he landed his first tenure track position at Florida State University, working at the National High Magnetic Field Laboratory (NHMFL) on the synthesis and characterization of new magnetic materials. He then returned to the University of Winnipeg to become the Canada Research Chair in Quantum Materials Discovery. 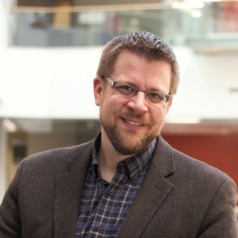 Professor Wiebe has held multiple administrative positions such as President of the Canadian Institute for Neutron Scattering (CINS), and as Chair of the NHMFL User Committee. He is also a fellow of CIFAR's Quantum Materials Division.